The Way family thus came in 1787 to the area of Marlow, Cheshire County, New Hampshire, joining some 200 souls just recently settled there. Have a look on a map…Marlow lies some 260 km North of Lyme, Connecticut…and 270 km South-East of Stanstead…Halfway… The area is beautiful. Broken with hill and valley, fields and forests, it is watered by the Ashuelot River which flows into the Connecticut River. 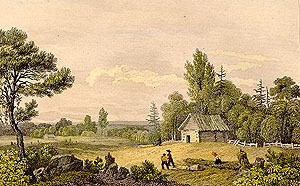 The Connecticut served as a «highway» for settlers from Lyme to within a few rough kilometres of Marlow. Goods were probably shipped up the Connecticut, perhaps as far as the Walpole area and then brought to Marlow by ox-cart. Daniel Senior was not the only one to have made that trek from Lyme, Connecticut to New Hampshire. Before him, members of the Mack and Miller families had made the move. And the founding fathers of Marlow themselves, Samuel and John Gustin, also came from Lyme, Connecticut. Not only were they neighbours, they were friends. For many years, the Ways, the Gustins, the Macks and the Millers farmed the land around Marlow and harnessed the waters of the Ashuelot to build dams and operate grist mills and saw mills. They contributed much by their hard work to the growing Marlow community. Wells Way, born in 1769, was the oldest son of Daniel Senior. A young man of 18 when he arrived in Marlow with his parents and siblings, he eventually became town clerk and kept that office for 23 years. He was also a town representative for many years. Known as «Squire Way» (a quality bestowed on notable residents), he was the arbiter of many a local dispute. He also acted as a surveyor around Marlow and the surrounding towns. Wells’ oldest son, Horace Wells Way, operated a tannery in the town of Marlow for a few years. Another one of Daniel Senior’s sons, Asa Way, born in 1775, amassed in his lifetime a considerable amount of money for those days. He would donate, upon his death in 1859, some $2,000 to the Universalist Societies of Marlow and Lemspter for the support of preaching, and some $1,000 to those two towns for the support of schools. Daniel Way’s character was shaped not only by the men around him, but also by the women in his family who had married them. Daniel had several aunts, three of whom played, though indirectly, a significant role in his life as will be seen later. His eldest aunt, Esther, born in 1771, married John Gustin Junior, one of the sons of Marlow’s first settler, John Gustin. John Junior was known as a good English scholar and mathematician. Daniel’s second aunt, Sally, born in 1778, married Ira Miller. His third aunt, Ethelinda, born in 1780, married Silas Mack. Like father like son. These young men would not be satisfied with settling permanently in one place. The Gustins, the Millers and the Macks had other plans, which would soon take them and their families North into the «wild» lands where Vermont met Lower Canada (as Quebec was then called).